"It's not the anti-Israel propaganda and it's not the BDS campaign. There is no need to give them an honor they don't deserve. It's the Israeli government." Ben-Dror Yemimi, veteran Israeli columnist, in YNET: Israel losing public opinion support in US. A recent poll found that a 47% plurality of the American public would be in favor of imposing economic sanctions on Israel for the ongoing construction in the settlements. Q. Aleppo in northern Syria is falling to the Assad regime and its allies from Russia, Iran and Hezbollah. What are the ramifications for Israel and the region? Q. What will happen to Assad’s Russian, Iranian and Hezbollah allies as his regime regains control? Q. Lebanon too is part of Iran’s hegemonic design? Q. You mentioned Turkey and the Kurds. What sort of Turkey is emerging from recent years’ revolution in neighboring Syria and recent months’ abortive revolution in Turkey itself? Q. What sort of regime can we now expect to develop in Syria? Q. Where does all this leave Israel? Q. How does it contribute to enhanced Israeli-Sunni Arab relations? Q. How does Syria affect the Palestinian situation? Senator George Mitchell, President Obama's Special Envoy to the Middle East in 2009, and Alon Sachar, who served with Senator Mitchell among several other positions connected to Israel and peace negotiations, will discuss their newly released book A Path to Peace: A Brief History of Israeli-Palestinian Negotiations and a Way Forward in the Middle East. The book has been described as providing "a practical roadmap for bringing peace to this complicated, troubled region." Go HERE for more on the briefing call speakers. If passed, the "Legalization Bill" will retroactively legalize settlement contstruction in the West Bank, which a State Department spokesman has said "would be a dramatic advancement of the settlement enterprise...already greatly endangering the prospects for a two-state solution." According to media reports, the Israeli government has decided to relocate settlers from the Amona Illegal Outpost to adjacent West Bank land, contrary to previous Israeli court legal opinions. 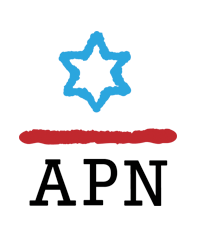 Given the choice of partner (Azerbaijan) and the choice of venue (Trump International Hotel), APN lodged its objections and chose to forego last night's Hanukkah Party of the Conference of Presidents of Major Jewish American Organizations. We urge President-elect Trump to avoid destabilizing moves and statements pertaining to moving the US embassy to Jerusalem, one of the most politically, religiously and culturally sensitive places on earth. Fania Oz-Salzberger: "For Argument's Sake"
Historian Fania Oz-Salzberger is the author of "Jews and Words" with her father Amos Oz, the renowned Israeli author and a founder of Peace Now. In a special letter for Americans for Peace Now, Oz-Salzberger reflects on her Jewish and Zionist legacies, and her belief in their future crowning achievement: a peaceful and democratic Israel.